Material Fee: There is no material fee for this class. Students will be allowed to use instruments as appropriate for each class. Explore the World of Music with Music Camp! Our Music Camp offers young children the opportunity to actively explore the world of music for the first time! 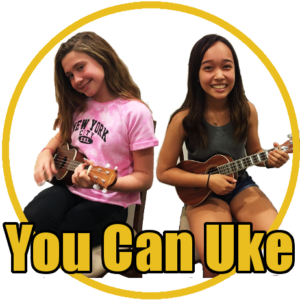 This one-day camp will allow students to be introduced to three musical instruments: ukulele, drums & voice! 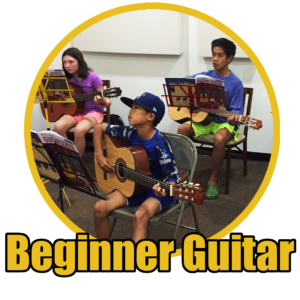 Music Camp is of great benefit to any parent whose child has always wanted to play an instrument, but who has never had the opportunity to do so. It’s also a great benefit to parents who are interested in music lessons, but who are not sure what instrument would best suit their child/children. Lastly, if your child already plays an instrument, this music class is a fun way to get introduced to a different instrument in a stress free environment! Understanding the order of musical notes. Learning how the musical staff is organized and how notes relate to one another. Understanding rhythmical note values and their names. Basic ear training will be covered by listening and identifying musical quality. If this is not enough, Music Camp will also expose children to the dynamic of playing as a group (ensemble). Through teamwork and listening skills, students will be challenged to play simple songs as a group. This will showcase the level of focus and practice it takes to learn not only learn an instrument, but to learn to play music with that instrument! The Camp is limited to six students total, so register while there is still room! There is no material fee for this course. Students will be allowed to use instruments as appropriate for each class. Registration for the course if final. There are no make-up opportunity if a class is missed.